A&E Pulls A Cracker Barrel, Lifts Suspension of Phil Robertson of Duck Dynasty - Good Work GLAAD! 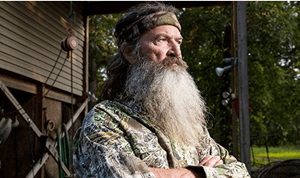 Home/Entertainment/A&E Pulls A Cracker Barrel, Lifts Suspension of Phil Robertson of Duck Dynasty – Good Work GLAAD! A&E Pulls A Cracker Barrel, Lifts Suspension of Phil Robertson of Duck Dynasty – Good Work GLAAD! Well its over for now. And guess who lost? A&E and the Robertson family announced Friday that Phil Robertson, the man who thinks that blacks were better off under Jim Crow laws and that being gay is the same as performing beastialtywill still be part of the series Duck Dynasty — and since he didn’t miss any filming, his temporary suspension will have no effect on the upcoming fifth season and really was worthless to begin with! One has to wonder since “ advocacy groups” were involved exactly much of a donation from A&E both GLAAD and HRC received.? This was a horrible fight to lose and opens up a Pandora’s box of hate speech under the guise of “Freedom of Speech” and once again its all due to the incompetence and lack of backbone of The Human Rights Campaign and GLAAD. I would fight for his right of Free Speech(do not endorse him) . Let us hit them in the Wallet , as we did with Florida Orange Juice , , Anita (bigot)Byant.